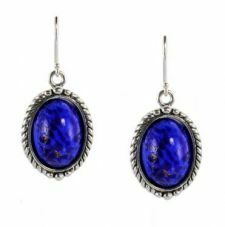 Antique designed earrings with vintage Czech lapis Glass in a rope frame suspended from ear wires. Manufactured to order. Ball end style ear wires for custom earring designs. The open ended loop makes it easy to interchange your dangle creations of bead or gemstones. Available in 14k yellow or 14k white gold. Ball end style ear wires for custom earring designs. The open ended loop makes it easy to interchange your dangle creations of bead or gemstones. Available in 14k yellow or white gold. 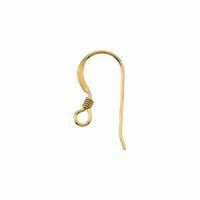 Flat French hooks with a coil accent and open ring to attach your dangle creations of bead or gemstones. Sterling silver plain style ear wires for custom earring designs. 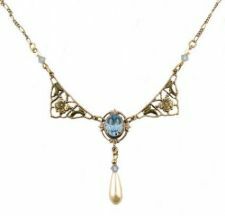 The open ended loop makes it easy to attach your dangle creations of bead or gemstones. 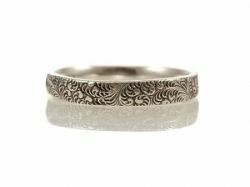 A vintage Art Deco inspired patterned petite sized band for pinky or midi ring with an antiqued finish. Large sized 24x15mm ear clip slide on 'Comfee' cushions. Sold in packages of 24. 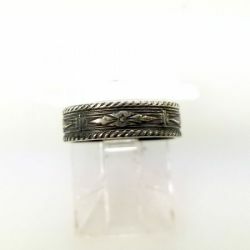 This ring is a copy of an antique item that has been reproduced to look exactly like the original early 1900's one. 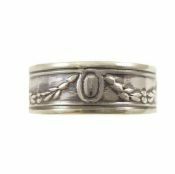 An antique style 6.7mm wide with a continuous embossed garland swag pattern on a low profile cigar band. Made from milled patterned stock that was imprinted by antique roller wheel dies. 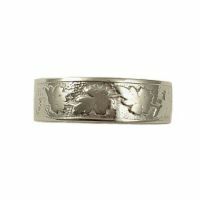 An antique style 5.8mm wide with a continuous embossed leaf pattern on a low profile cigar band. Made from milled patterned stock that was imprinted by antique roller wheel dies.